Do you the look of layering clothes, but hate the bulk/heat that multiple layers give off?! If so then I found a great new product to tell you about HALFTEE!! 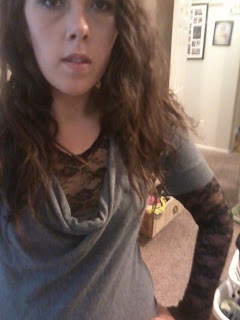 I Chose the Full Lace Long Sleeved﻿ HalfTee, in Black! I Love this top! It's great and so pretty to wear under almost anything! 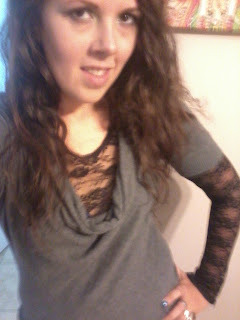 With my HalfTee I can add the beauty of lace to just any shirt or dress. Lace is just wonderful looking but not something I want to fully wear since it's a little warm and not normal shirt material so the HalfTee is a great thing to have to be able to add Lace to anything! HalfTee Carries So Much for Women, Girls, and Maternity in several styles, from short sleeves, 3/4 sleeves, long sleeves and multiple color choices! Overall I love HalfTee it's a great way to add layers without the bunching and bulk that full shirts add and Also a great way to add style and versatility to your outfits! What a great idea!! Why did I not think of that?! Thanks for the review especially about the sizing. kristiedonelson(at)gmail(dot)com Thank you.